Our laboratories take pride in over 25 years’ of experience in DNA and paternity testing. Benefit from our global medical testing network today by visiting our website or our research centers that are fully furnished with the most recent medical technologies and innovations. All your results will be processed on our laboratory information management system and Dual Process ™ system (twofold check) ensuring utmost credibility and traceability. All our DNA and paternity tests are acknowledged and accredited by the department of justice in the United Kingdom and the United States in conformity with Section 20 of the Family Law Reform Act 1969. Our laboratory has also been awarded by the international ACLASS accreditation certifications services (ISO / IEC 17025) and ASCLD/LAB. All of our DNA and paternity tests can be ordered for personal reasons or to satisfy legal or forensic requirements. You can reach our experts in genetics by phone every day from 9 am to 10 pm (for free) or by filling in our online enquiry form. We treat each client with care and respect because we know that every DNA & paternity testing are unique and personal. Thousands of families each year trust EDC with their DNA & paternity testing need. Our commitment is to help you find answers to life’s most important questions. You will only receive the most reliable DNA testing results ensured by our Dual Process™, advanced robotics, and PhD sign-off. Same-day paternity testing is available upon request and we can provide you with the results of other types of DNA tests faster than other DNA testing laboratories. We understand that confidentiality is of crucial importance to our clients and therefore we follow a strict confidentiality policy. It is our goal to ensure that our top quality and reliable DNA & paternity testing services are affordable, therefore we offer flexible payment plans to our clients. Why is EDC (Express Diagnostic Center) the most reliable paternity and DNA testing service provider? We will make sure that you understand the whole procedure and we will ensure that you receive the DNA or paternity test that suits all your personal needs. You will receive your DNA collection kit at home within 24 hours. It’s easy to collect a DNA sample with a simple cheek swab in the comfort of your own home. Use the prepaid envelope included in your kit to submit your DNA or send it via first-class USPS or courier service. We perform your DNA or paternity test twice to guarantee the most accurate results. Only our DNA & paternity testing laboratory goes this extra mile for all paternity tests. The following business day we will inform you via email that your results are available. All you will need to do is to login to our secure website. Only our research center performs each paternity DNA test twice to guarantee the most accurate outcome. As soon as we receive swabs in our laboratory, we register them and divide into two to start our proprietary process. Two autonomous groups perform separate DNA testing. During each step, your swab samples are tracked, identified and compared with our records and a staff member signs off at each point. As we use robots during most sample preparation processes, the possibility of a human-caused error, such as sample switching and/or cross-contamination, is eliminated. Laboratory directors, who are PhD’s, examine the raw data produced from the independent DNA tests and make certain that the results match. Then the necessary statistical calculations are made to establish the issue of paternity, identity, and family relationship. EDC is the only paternity testing laboratory using a full parallel testing process that eliminates any possibility of false results. The AABB (American Association of Blood Banks) granted EDC its “Commendable Practice Award” for being the first laboratory to implement Dual Process™ for quality testing. Once we receive all samples of the parties in question, we will perform the standard paternity testing within 1 or 2 business days. We will provide you with the exact time of delivery when you order your DNA test. Thereafter, you can login to our online system to see your DNA results. Should you have a pending court date and time is of paramount importance, we will provide your DNA results the following day after we have received the samples in our laboratory. Please contact by phone one of our knowledgeable paternity experts to arrange an express service. DNA results are available on our website and that is the quickest and most appreciated method by our customers to access their DNA results. In case you need to receive your DNA results sooner than first-class mail permits, we offer two other options for a nominal fee. Most companies offer only one DNA test or paternity testing at one price, but our research center provides its customers with the most comprehensive choices. We advise you to call our toll free number to be sure that you receive the DNA test that corresponds to your needs and to find out if you qualify for our monthly discounts. Please call us to find out about our pricing policy. It is our goal to ensure that the best DNA testing services are accessible and affordable to our clients, therefore we offer flexible payment plans for those who need extra time to pay for our services. Contact by phone one of our helpful case managers to discuss possible payment options. 98% Customer satisfaction: Our goal is 100%! Our laboratory maintains the confidentiaity of our customer and never discloses personal information or test results without prior client consent. We ensure the highest level of protection of our clients’ privacy and therefore we follow a strict confidentiality policy. We will not disclose your data to anybody without your approval. We will always act according to your instructions concerning communication with you or other individuals involved in your DNA test. We never release DNA test results over the phone. Only our research center performs each paternity DNA test twice to guarantee the most accurate outcome. As soon as we receive swabs in our laboratory, we register them and divide into two to start our proprietary process. Two autonomous groups perform separate DNA testing. During each step, your swab samples are tracked, identified and compared with our records and a staff member signs off at each point. As we use robots during most sample preparation processes, the possibility of a human-caused error, such as sample switching and/or cross-contamination, is eliminated. Laboratory Directors, who are PhD’s, examine the raw data produced from the independent DNA tests and make certain that the DNA results match. Then the necessary statistical calculations are made to establish the issue of paternity, identity, and family relationship. EDC is the only paternity testing laboratory using a full parallel testing process that eliminates any possibility of false results. 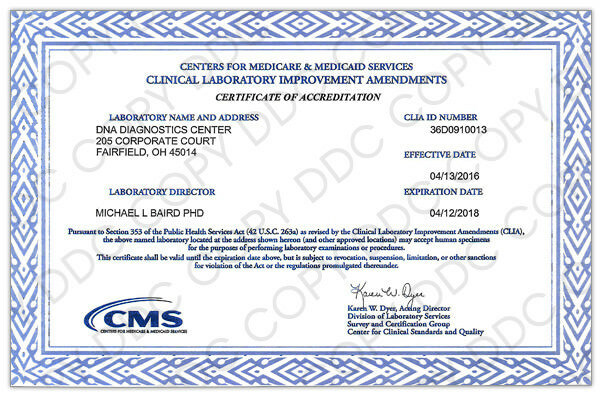 The AABB (American Association of Blood Banks) granted EDC its “Commendable Practice Award” for being the first laboratory to implement Dual Process™ for quality testing. Our laboratory searches for and employs the best and most resourceful researchers who share our faith in helping other people by performing predominant DNA results and analysis. Every single DNA test is unique, and some DNA tests shall be analysed even more than others. Our DNA specialists have acquired considerable professional experience to make scientifically sound conclusions on every case, even in cases involving genetic mutations or unusual biological relationships. Our team of researchers is thoroughly trained and during several years, our center has gained an unrivaled expertise in relationship and identity DNA testing on a worldwide scale. 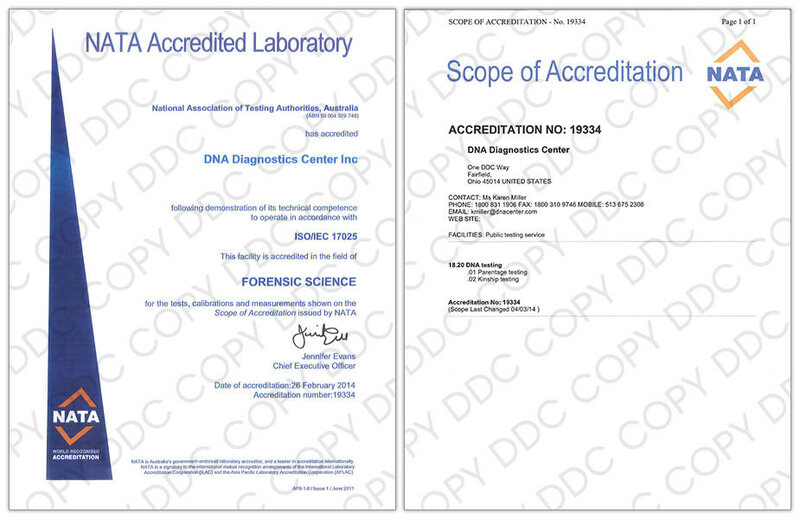 EDC is the leading DNA and paternity testing company on a global scale and is one of the most accredited laboratories throughout the world. The brand-new DNA laboratory is equipped with multiple robotic DNA extraction platforms. The EDC DNA testing laboratory employs an extensive laboratory process involving bar-coded DNA samples, robotics and a laboratory Information Management System (LIMS), thereby ensuring the highest possible quality of DNA and paternity testing. 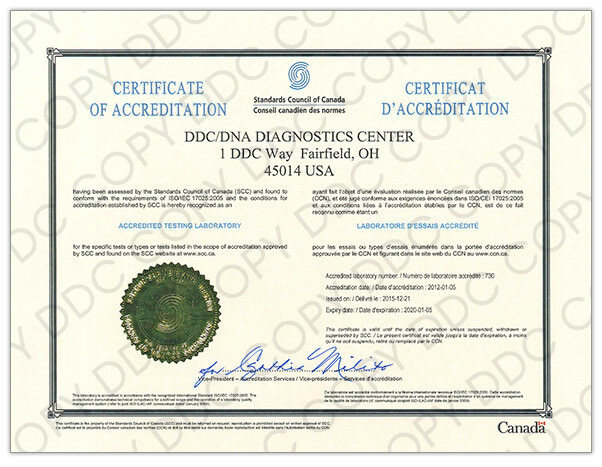 To guarantee superior quality for our clients, EDC regularly and deliberately participates in laboratory accreditations for DNA paternity testing and proficiency testing programs developed to improve standards and practices among laboratories and companies. 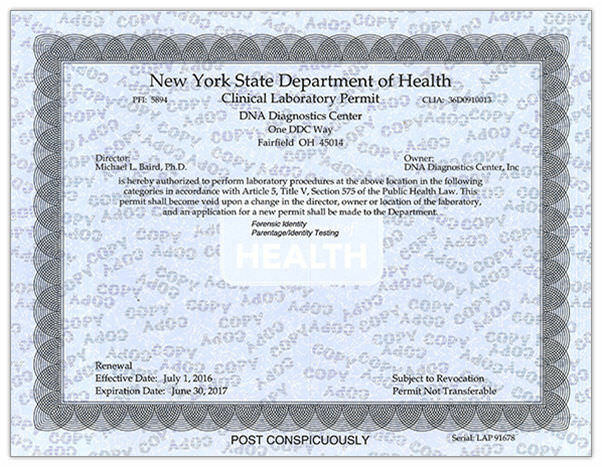 Accreditation agencies, such as the AABB, L-A-B (ISO-17025), CLIA, NYSDOH and CAP regularly evaluate our DNA testing laboratory for adherence to standards of cleanliness, competency, work quality, protection of consumer privacy and results accuracy. 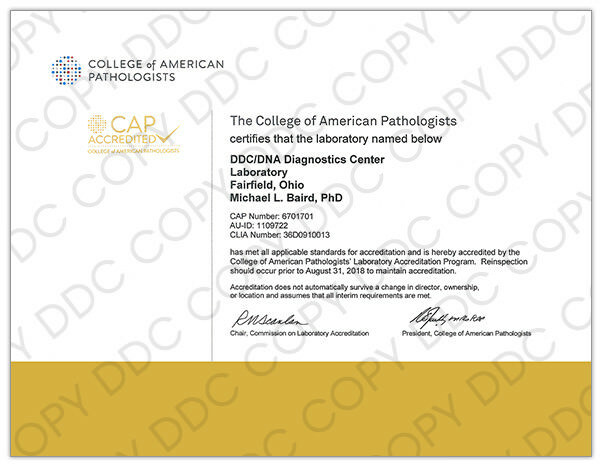 This accreditation includes sample accessioning, laboratory extraction, data analysis, and secure DNA paternity test results reporting. Our employees: At EDC, we are devoted to you. It begins with our customer service team consisting of well-prepared, intelligent and caring experts. Once we receive your DNA test samples in our laboratory, EDC’s outstanding team of researchers, technicians, and PhD’s attentively receives, prepares, amplifies, sequences, and analyzes your DNA samples to produce solid results with excellent accuracy. Our processes: A continuous improvement is necessary to maintain the status of the leading company of genetic testing for over 20 years. EDC was the first to use robotics technology in its research center, ensuring highly stringent and efficient processing of DNA samples. The company was recognized by the American Association of Blood Banks (AABB) for its Dual Process™, in which paternity cheek swab samples are independently tested twice, producing DNA results of the highest possible quality and accuracy. EDC has acquired the reputation of one of the most trusted laboratories worldwide through uncompromising attention to detail and a successful pursuit of its processes. Our passion for providing help to other people: Here at EDC, we love our job. By providing DNA and paternity testing, we help changing the lives of others for the better. For example, we are happy to help a young mother to determine the father of her child, to provide persuasive evidence for an immigrant’s visa petition, or to assist a breeder to identify disease traits in their animals. We can make a difference. Each day we positively impact our clients, and even go one step further by donating our services to many State Innocence Projects. To find out more about our participation, visit our social responsibility page.